Four pretty rainbow blocks are now sewn and just had to lay them out and admire them. I am looking forward to seeing what the rainbow colour for May is. Next on the list was to make a start on my version of Kris' daisy bag. 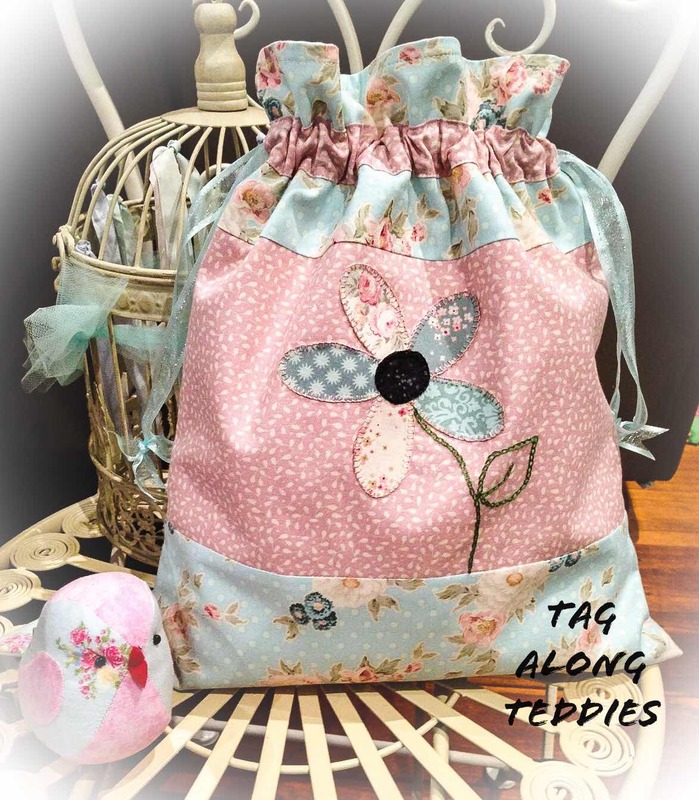 So far the front sections of the bag have been sewn together and the casings for the drawstrings have been sewn in place both on the front and back. I have also chosen the fabrics for the petals, centre and leaf of the flower. If all goes to plan tomorrow I can see a finish on the horizon. Time to head on over to Wendy's blog to see what the others who signed up have created. Hubs and I have spent the last three days with Miss M doing all the holiday things like the park, the zoo and some clothes shopping so after taking Miss M home this morning was spent catching up on the domestics. Time allowed me to head off to my sewing room this afternoon and make a start on cutting and sewing up my aqua log cabin blocks. All was going well and I was steaming ahead thinking that not only will I get the blocks all sewn up but I can even get the four of them sewn together. Why is this not going together?????? After turning it this way and that I finally figured out what the problem was. No worries just a bit of unpicking and ready to go again. Still not right....more turning this way and that and after just about unpicking the whole block I finally got it. I gave them all a good press and left them to finish off on Friday night when I join with Wendy and the others for FNSI. I was a winner on two fronts this week. 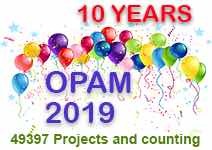 Firstly my name was drawn as the winner of OPAM for February month which Kris from Tag Along Teddies hosts each month. My prize of one of Kris' lovely designs landed in my in-box the other day. I have already mentally chosen the fabrics which will hopefully compliment the design. My second win was an envelope which arrived in the mail today all the way from WA from the very generous Maria from Life on the block blog who saw my very small collection of aqua scraps and sent me this lovely variety of aqua fabrics. Once these are made up I will have the prettiest aqua log cabin blocks. During the week I did manage to sew the Velcro tabs on twenty bibs. This is what a stack of 20 bibs looks like. 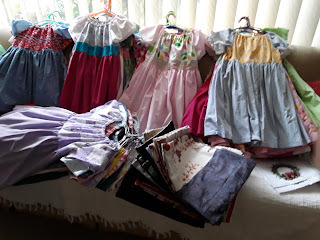 I mentioned in an earlier post that my sewing partners and I had reached our goal of 60 size 6 dresses and they can be seen all lined up below. The 35 library bags in front of the dresses were also made by me. 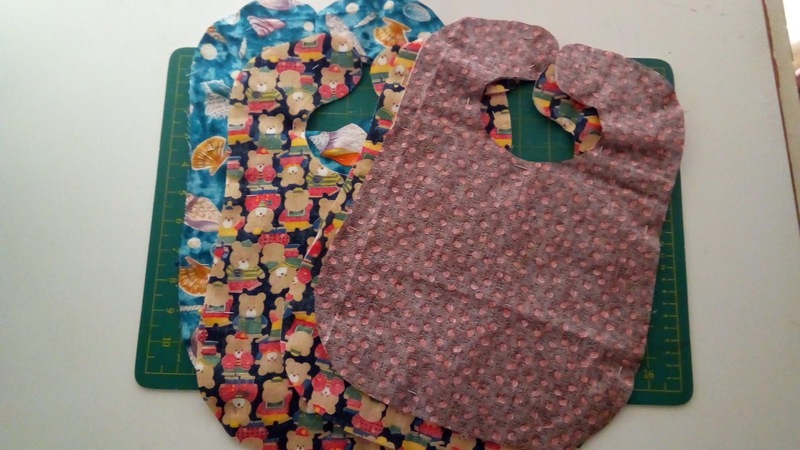 After sneaking off into my sewing room after lunch saw me make a start and finish on getting the top stitching done on the bibs that I was working on yesterday. Once these were top stitched I was able to move on and cut out a few more. When these are stitched and top stitched they will join the others for the Velcro closures to be sewn on. Time to head on over here to see what Cheryll and the others got up to during their crafting time. My sewing partners and I have completed our goal of 60 size 6 dresses so time to concentrate on bibs. 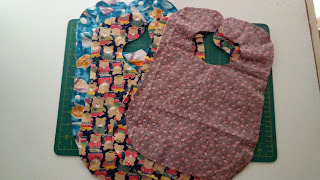 It was a lovely morning so I moved my sewing room outside and made a start on sewing up some bibs. Now comes the boring bit of clipping around the curves and turning them. I find the blunt end of a knitting needle comes in very handy for this task. Sometimes the pointy end of the needle needs to be used to push out some of those hard to get to curves but only a slight amount of pressure needs to be used otherwise a hole can appear. Ask me how I know!! Here are some already turned, ironed and ready to top stitch but I will keep that job for FNwF. If you would like to join in the fun tomorrow night sign up here. The rainbow challenge colour for April is aqua. Grabbing out the scrap bins this is all that was found in aqua. These won't go far in making 4 log cabin blocks which will be my OMG for this month. I know that there are more pieces in my stash so that will be this afternoon's job to go through and find as much aqua as possible. I have been working on and off on these dresses during the month. They will be delivered tomorrow to my "sewing partner's house" who is keeping a tally on our numbers. When our goal number has been reached we will move onto helping those making size 10. A request has also been made for bibs for ages 1-2 to be made. 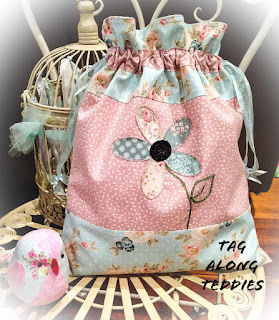 These are very quick and easy to make using up some cute fabrics that have been lying around my sewing room for sometime.